The European Commission President didn’t mince his words last night. ANY HOPE THAT the EU deal on a banking union would lead to retrospective recapitalisation of Irish banks appeared to be dashed last night. 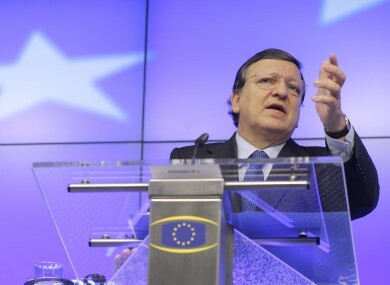 The head of the European Commission Jose Manuel Barroso told a press conference that Ireland’s problems had not been caused by the EU. Indeed, he said that Ireland’s banks had caused major problems for the Eurozone. “It was the Irish banks that created a big problem for Ireland but also the other countries in the euro area. This should be taken into consideration. “It would be wrong to give the impression that Europe has created a problem for Ireland. He went on to say that the Euro was not to blame for Ireland’s problems, saying that the currency had been a “victim” of the Irish banking sector. Barroso’s stern words came just as EU leaders signed off on a key tenet of the proposed banking union – a fund that can shut down or restructure ailing banks. Email “'Ireland wasn't a victim of the Euro, the Euro was a victim of Ireland's banks'- Barroso”. Feedback on “'Ireland wasn't a victim of the Euro, the Euro was a victim of Ireland's banks'- Barroso”.